State Bank of India hikes lending rates, and other banks pick up the signal. State Bank of India, the country’s largest lender, on Thursday raised its benchmark lending rates by up to 25 basis points for the first time since the marginal cost-based lending rate (MCLR) regime was introduced in April 2016. One basis point is 0.01 per cent. The rate hike, effective immediately, comes a day after the bank raised its deposit rates by as much as 50 basis points (bps) across various maturities. While a change in deposit rates takes time to reflect on a bank’s balance sheet, a lending rate affects yields immediately and makes equated monthly instalments costlier for borrowers. Therefore, home and automobile loan takers will soon have to shell out more EMIs towards their loans. For home loans up to Rs 3 million, the impact may not be much as rates have risen by only 5 bps in that category. SBI is also the de facto signalling bank for the country, as any rate action taken by it gets followed by others. Rates in the economy seem to have hardened, even as the Reserve Bank of India kept its policy rates unchanged for the third time in the February policy. Soon after SBI’s announcement, the second-largest lender, Punjab National Bank, and the largest private sector lender, ICICI Bank, also hiked their lending rates by 15 bps each. Other private banks such as Axis Bank, HDFC Bank and IndusInd Bank have already started hiking their MCLR rates as bond yields harden and cost of funds rise. MCLR, by its very nature, is linked with market rates and if yields harden, MCLR rises automatically and vice versa. SBI’s one-year MCLR was raised by 20 bps to 8.15 per cent from 7.95 per cent earlier. The six-month MCLR has been raised by 10 basis points to 8 per cent, while the two-year rate has been raised by 20 bps to 8.25 per cent and three-year loan pricing by 25 bps to 8.35 per cent. The cost of funds also fell from 6 per cent to 5.42 per cent. However, their NIM contracted by 26 bps to 2.45 per cent in Dec ‘17. NIM is the difference between yields on advances and cost of funds. The bank had seen a contraction in its yields on advances from 9.41 per cent in December 2016 to 8.38 per cent in December 2017. The cost of funds also fell from 6 per cent to 5.42 per cent. However, their NIM contracted by 26 bps to 2.45 per cent in December 2017. “At the same time, the bank has tried to minimise the impact on those with lower income and affordable housing segment. Hike in lending rates is just five bps for housing loans upto Rs 3 million,” said Gupta. EMIs vs SIPs: How should you pay for your purchase? 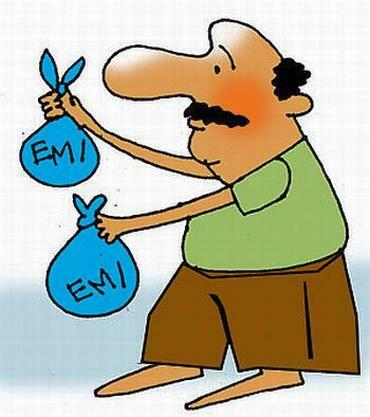 How EMIs destroy your dreams!